Did you ever wonder what it would look like if someone put an entire box of bandaids on at one time? Well now you know. Isla says you're welcome. The other night, while trying to calmly remove Connor from the lego isle at Target, Isla spotted a box of Dora bandaids and quickly grabbed them. She could sense my weakness, with all my strength going toward not buying Connor a huge lego just to keep him from melting down in public. 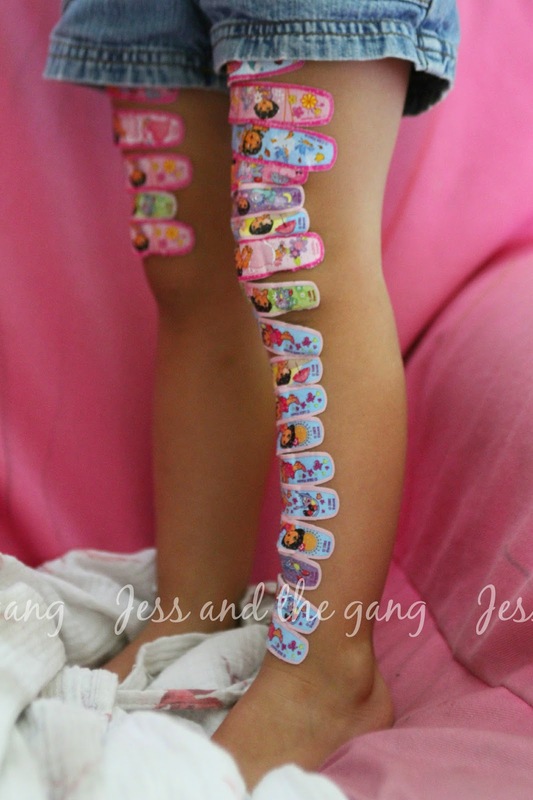 Anyway, we leave the store, Isla opens the bandaids in the parking lot. Said bandaids scatter all over the parking lot in the wind. Ian and I scramble to pick them up as Isla cries. We put the kids in the car and head home. On the way home, Isla proceeded to put every single last bandaid on her legs. She walked really slowly, without bending her one leg because her knee was covered. After a day, I gave her a bath and they all fell off in the bath. It was drama. But, what can I say, the girl likes Dora and she likes bandaids, so I could see how them all falling off in one go could be trauma. I kind of felt like that was a waste of $2, then I remembered that it is also a waste of $2 when I go to Starbucks rather than just making myself coffee at home. So, Isla can stick an entire package of bandaids on herself from time to time because, it really does make her oh so very happy. On a side note, I realize Isla's chair is totally dirty in this picture. It is her favorite chair, after all. And when something is her favorite, she cant help but draw all over it any chance she gets. Really, it isn't dirty...it is a one of a kind piece of art. I'm glad they came off peacefully in the bath. Taylor loves bandaids but it's dramacity if we have to take them off. She acts like the pain of taking a bandaid off is comparable to water torture.